Sometimes you find the right book at the right time. 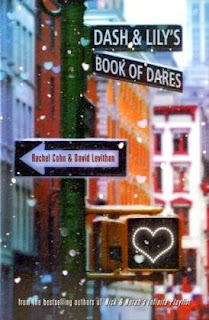 I was loading up my kindle for a winter trip to New York and added Dash and Lily's Book of Dares because I like David Leviathan and was interested in seeing him collaborate with an author I hadn't read, Rachel Cohn. Plus, I like the idea of two strangers (and fairly strange) teenagers getting to know each other through a red moleskin. It turns out, all of the dares upon which Dash and Lily embark take place where I was vacationing. When Lily made Dash see the insane Christmas lights at Dyker Heights, I was there with my friends' kids. When Dash made Lily brave Rockefeller Center days before the holiday, I was crushed by the crowds as well. Their adventure was my adventure and I loved it. Not that I am without complaints. I find it to be lazy writing when parents are removed from the picture; it was unrealistic to me that all the parents were away on Christmas and the characters were left in the care of their negligent relatives. I also thought that the characters could be overly cutesy and whimsical at times. But maybe I am just being a grinch, because if there is ever a time for idiosyncratic teenagers, it's the holidays! I read that the novel is being made into a movie and I am eager to see it; it would be a great way to prolong my vacation!